Tim Burton maintains his quirky sensibilities in this live-action revamp of Disney's 1941 animated classic. The story about outsiders is an obvious fit, and Burton also stirs in some of his heightened imagery and darker themes to give the movie some resonance. Otherwise, the big action beats and only slightly textured good-versus-evil plot feel vaguely simplistic. But it's colourful and often thrilling, and never hammers in an obvious message. In 1919, the Medici Brothers Circus crisscrosses the American South with its collection of freaks and animal acts, led by the fast-talking Max (DeVito). In Missouri, they're rejoined by rodeo rider Holt (Farrell), who lost a limb in the war and his wife to influenza, and has two lively children (Parker and Hobbins). 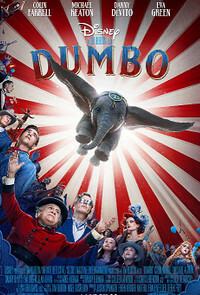 Holt is put in charge of newborn elephant Dumbo, and the kids realise his enormous ears can help him fly. So a new circus act is born, attracting the attention of wealthy businessman Vandevere (Keaton) and his high-flying girlfriend Colette (Green). The nastier story edges have been sanded down by the Disney machinery, rather clunkily adding 21st century animal-treatment attitudes. Cruelty is only ever dished out by obvious villains, while the heroes seem supernaturally attuned to the wishes of the creatures in their care. But this also adds a level of resonance to the film, building up an emotional layer for both the humans and sensitive little Dumbo, as the bad guys set out to separate him from his mother for no real reason. The actors are solid, adding little quirks to their characters to make them entertaining. Farrell kind of flies under the radar in this sense, never overplaying Holt's innate heroism or the slight twinkle of romance with Green's strong-willed and likeable Colette. Of the kids, Parker skilfully takes the lead as the intensely curious Molly. Keaton is essentially just shifty but has a bit of fun with a character who eerily echoes Uncle Walt. And it's always enjoyable to see DeVito cut loose in his inimitable way. While the film's visual effects are first-rate, it's the quirky details that make the story work, combined with some depth of feeling among the characters. The emotions are never as pungent as the original, mainly due to how the story plays out, but the filmmakers have updated it with sensitivity and a clever depiction of how these characters feel about their various odysseys. This makes it not only entertaining and eye-catching, but also darkly provocative and sometimes moving too.